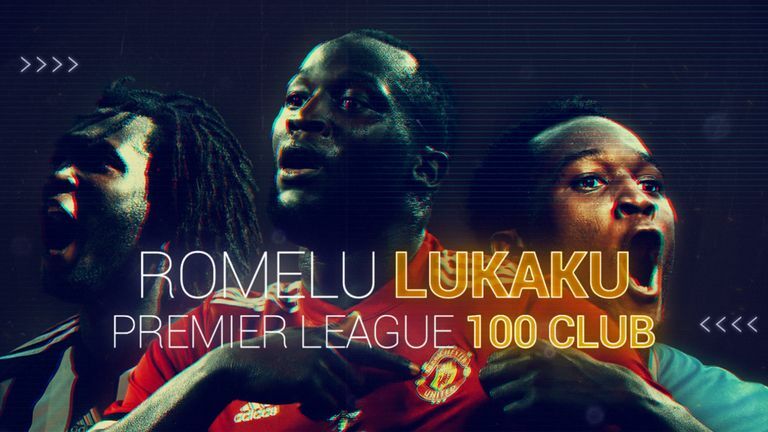 Romelu Lukaku entered the Premier League 100 club with his goal against Swansea, watch some of his best strikes here. Romelu Lukaku struck his 100th Premier League goal as Manchester United claimed a 2-0 win over Swansea on Saturday. The Belgian's deflected opener was his 15th Premier League goal of the season and helped Jose Mourinho's side consolidate their place in the table behind leaders Manchester City. Lukaku is the 28th player to score 100 Premier League goals and he reached the landmark in his 216th appearance, making him the 12th quickest, just ahead of Didier Drogba (220). At 24 years and 322 days old, Lukaku is the fifth-youngest player to reach 100 Premier League goals, behind only Michael Owen, Robbie Fowler, Wayne Rooney and Harry Kane. His total is spread across three clubs. Lukaku did not score a Premier League goal for Chelsea, but he hit 17 on loan at West Brom in 2012/13 and 68 for Everton in addition to his 15 for Manchester United. Lukaku has reached double figures for Premier League goals in six consecutive seasons, with the 2016/17 campaign at Everton, when he netted 25, being his most prolific. Lukaku has scored 52 of his total with his favoured left foot, adding 26 with his right, 21 with his head, and one listed as 'other'. Ninety-five of his goals have come from inside the box - including six penalties. Lukaku's favoured opposition is West Ham. The striker has scored nine Premier League goals in 11 appearances against the Hammers. He has scored eight times against Sunderland and six times against six different clubs. Alexis Sanchez provided the assist for Lukaku's 100th goal in Saturday's win over Swansea, but the player to have assisted him most is Everton winger Kevin Mirallas, who has set up 10 of his Premier League goals. Gerard Deulofeu (seven) and Ross Barkley (six) have registered the next most assists for him, with Anthony Martial and Juan Mata his top assisters at Manchester United (both three).